I’ve been saying “Knock on wood” lots these days and for good reasons. We are now into November and no one in my house has been sick! Usually, by this time of year, someone, if not all of us, have been miserable with colds or the flu. It’s pretty much a given when school starts that my daughter will bring home germs and infect our home. Shockingly, that didn’t happen this year for the first time ever. Let me just say that it’s been nice! 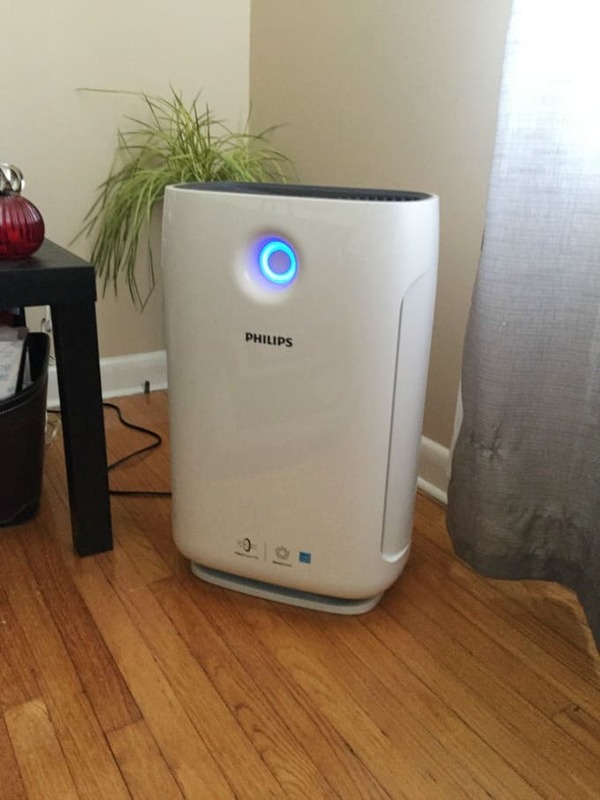 In the summer, we became the proud new owners of the Philips Air Purifier Series 2000i. I set it up in the living room which has access to the kitchen and entrances. It’s been running in the background for months working away monitoring and purifying the air we breathe. I think that it has something to do with us not getting sick! Not only does this air purifier monitor and purify the air, reducing allergens, gases and odours, but it also captures 99.97% of particles through its multi-stage active filtration system. It’s very sensitive – it can sense even a slight indoor air change. When it does, the fan speed adjusts so I always know when it’s working a bit harder to purify the air. I notice the fan speed increases when I’m cooking or baking and diffusing essential oils. Those activities take place in the kitchen and the air purifier picks it up from the far corner in the living room! The Philips Air Purifier Series 2000i works in medium to large rooms up to 277 square feet. My home isn’t huge and I find it to be the perfect size for our living room/kitchen combination. I think the coolest feature is the real-time feedback you get via the app. 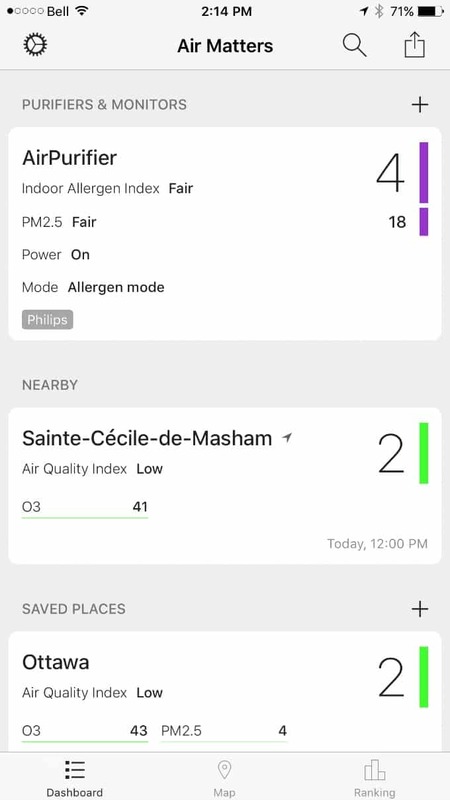 Once you’ve connected your air purifier to the app, you can monitor both indoor and outdoor air quality. The air purifier sends data to the app so you’ll always know how everything is looking. It’s neat that they also show you the outdoor air quality in your area with information about outdoor pollution and pollen. You can even control your air purifier through the app by changing the fan speed and setting a schedule. Plus, it shows you when your filter needs to be changed. When I’m home, I can quickly glance at the air purifier and see the colour ring on the front and quickly see at a glance the air quality. Blue is good and red is bad. Thankfully, I see mostly blue in my home. There is also a numerical display on the top of the air purifier with numbers ranging from 1 to 12. This index shows you whether you have good air quality (number 1) or bad air quality (number 12) or somewhere in between. As for settings, you have several options. You can choose one of the three automatic purification settings: General mode, an extra-sensitive Allergen mode and a power bacteria and virus mode. It also has five manual modes: Sleep (for very quiet) to powerful ‘Turbo Speed’ mode. Decisions, decisions. I use the Allergen mode. Visit Philips to learn more and find links to buy on Amazon or Best Buy. What do you currently do to purify your indoor air? This purifier sounds amazing. We open the windows to put fresh air in the house but this would be even better! Sounds like a really good air purifier to me. I’ve been thinking about getting one, this might just be the one for me. Does this help remove any dust from the air? I have inside dogs and seems I have more dust maybe because of. According to their site, it sounds like it would: Designed with a multi-stage active filtration system, which captures up to 99.97% of particles that pass through the filter as small as 0.3 microns – the size of most common airborne allergens, particles, bacteria and viruses. We’ve been looking for an air purifier for our house. I like that you can use an app with this.